Perfect for fans of Pixar's The Incredibles, Almost Super is a fresh, funny middle-grade adventure about two brothers in a family of superheroes who must find a way to be heroic despite receiving powers that are total duds. 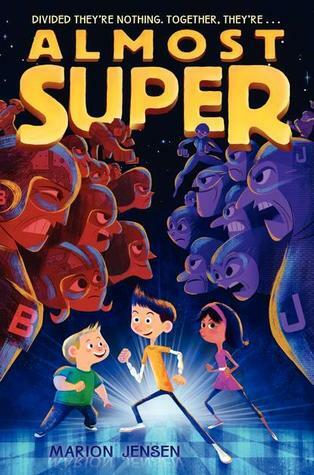 Filled with humor, heart, and just the right kind of heroics, Almost Super is a winning story that will satisfy would-be heroes and regular kids alike. Everyone over the age of twelve in the Bailey family gets a super power. No one knows why, and no one questions it. All the Baileys know is that it's their duty to protect the world from the evil, supervillainous Johnson family. Rafter Bailey wants nothing more to be a super hero like the rest of his family, so when his super power is a super dud, he’s disappointed that he’s only Almost Super. Even more confusing is that the villainous Juanita Johnson swears she is a super hero too, not a villain. Rafter knows something is going on, he doesn’t quite trust Juanita, but he may have to in order to figure out what is happening to his family. When both families lose their powers for more ridiculous ones, it’s obvious there is another villain out there. Lately, I seem to be drawn towards superhero books. Almost Super had a great mix of humor, action and mystery that makes it a fun and compelling read. I love that Rafter is open to realizing that the Johnsons may not be as evil as his family thought. I love the way everything was orchestrated by others to make these two families think they were enemies. Almost Super makes cheesy into funny, having the characters shake their fists when talking about the other family and some cliche moments that made me laughing hard. I love the fake super powers, like being able to light a match on polyester and turning your belly button from an inie to an outie. There was a lot of humor that seemed more elementary than middle grade and can see a lot of my 3rd and 4th graders loving this book. I’ll have to check this one out – I’m always drawn to books with superheroes.